I really wanted to like these, but, so far, these have been nothing but a headache. I purchased five of these in 265/70R17 SL from America's Tire (Discount Tire in CA) and had them mounted to brand new TRD Pro wheels. My FJ is stock height. In the last 3 weeks, I've been taken them back to America's Tire 3 times to have them rebalanced due to terrible vibration and wandering from 40-70mph. My FJ never had these issues with the old Bridgestones, and tracked perfectly. It seems that the technician even had to stack a bunch of wheel weights in layers on top of each other, three high, to try to get the wheel to balance properly without success. On the third try, they ordered two new AT3Ws and put all five tires on the road force balance machine. This helped, but there's still slight vibration. Then yesterday. I stepped out of the FJ and glanced at the front driver's side tire to find that chunks of the tread blocks have fallen off. I walked around to check the other three tires, but those were fine. I checked the pressures on all five tires, and they were anywhere from 32-33.5 psi, normal. Maybe I was unlucky and had tires from a bad batch. But in speaking with one of the techs at America's Tire this morning, he said that this same exact thing happened to another customer with a 4Runner. He says some of the AT3Ws are just not round, unfortunately. Good grief. I actually shied away from KO2s after reading of similar issues. So, here were are. They're ordering 4 new Wildpeaks today to see if they can make it right once and for all. We'll see what happens. Just a heads up, in case anyone else was thinking about purchasing these tires. Falken has to work out some quality control issues. Usually Yokohama as well as Nitto and Toyo have been very good to be in different applications over time, had severe balancing issues on my FJC with BFG KO2 so never again. Chris The Ogre likes this. I envy you, lol. Reviews like yours are what influenced my decision to go with the AT3Ws. In all fairness, they are incredibly quiet. And the guys at America's Tire have been super helpful during this process. I'm still holding out hope that they'll work out, but I kinda don't wanna get my hopes up. Will keep you posted. (snip) Then yesterday. I stepped out of the FJ and glanced at the front driver's side tire to find that chunks of the tread blocks have fallen off. I'm not seeing anything in your photos that remotely looks like "chunks of tread block falling off". 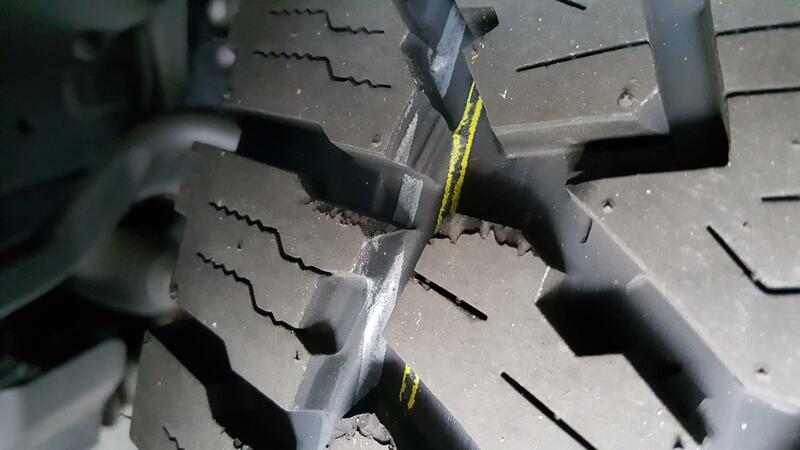 Could you post some photos showing exactly where the chunks of tread block have "fallen off"? 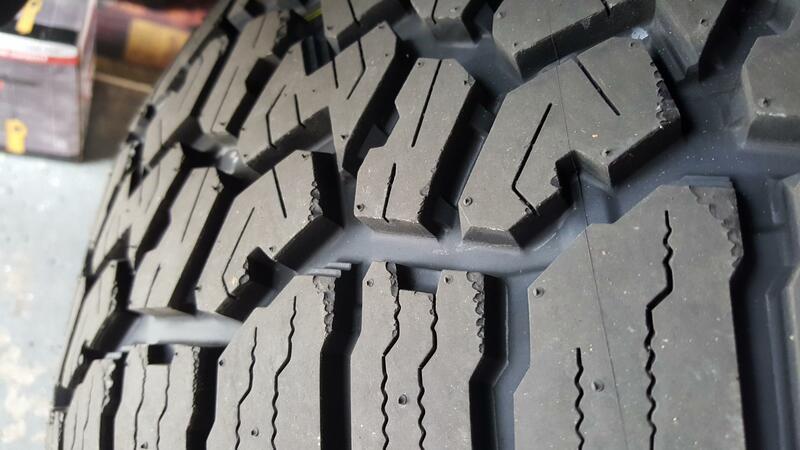 What I do see is where the leading edges of a few tread blocks have been slightly "nibbled" by spinning the tires on a gravel or slightly rocky surface. Whether "chunks" or "nibbles", it certainly doesn't look right, especially if all four tires have less than 30 miles on them from normal city and freeway driving. I haven't taken these on gravel or anything else, much less off road, so I have no idea why that one tire would look like that. I have taken my old tires on some gravely dirt roads, and none of them have had such nibbles taken out of the tread like this. Those nibbles are around the whole tire, not just that patch. The tech at the shop also says it doesn't look right, and have forwarded my photos to a rep at Falken. Appears to be a quality control issue. All the pieces off the leading edge? I am running 285/70/17's Falken WP's on steelies. They are 3 months old. 3000 miles. Just had them rotated. Mixed desert and highway use. No chunks missing . Have a slight hop on one corner because for some reason they keep throwing weights. 2x's now. A weight actually fell off while I was washing it! Pretty sure is a Discount Tire employee issue. Not a tire issue. Love these tires so far. Quiet and smooth. Does anyone find that these tires stink? New rubber smell is one thing . But after 3 months ? Especially after they warm up after a drive. Never heard anyone complain about Cooper or Yokohama tires. They just work. Woodsman, Thorn661 and CabinCruiser like this. Yokohama is a fine tire, @CabinCruiser has a beautiful set. I used Yoko’s for years with zero complaints, smooth and quiet. amaclach and CabinCruiser like this.